So, does Pet-Bots add anything new to the endless-runner genre? In our opinion: no. 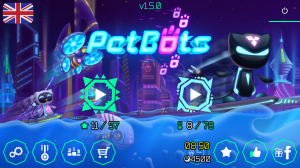 Though Pet Bots has it’s heart in the right place by adding a new-ish control scheme to this genre, it is let down by a clunky, unsatisfying implementation and uncompromising level design. It's not a terrible game though, and if the controls do somehow jive with you, then there is a generous amount of content to unlock that should keep you entertained for a long time. Daygames North are here with their self-described ‘FRESH’ take on the endless-runner game. Can their ‘innovative throwing controls’ make a splash on this well-trodden mobile genre? Before we answer that question we need to dive deeper into the game. 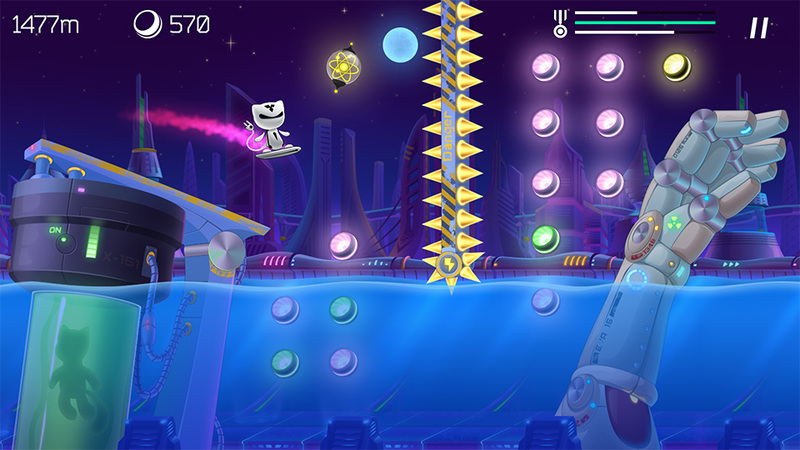 Pet Bots has a somewhat nonsensical story: The world has run out of energy and it is up to the team of Robo-Surfer Cat (my name, not theirs) and friends to collect random orbs scattered around the levels to supply the city with energy. But hey! We need to put this into context: I doubt anybody ever played Jetpack Joyride to find out more about Barry Steakfries’ dark and mysterious past, or why the eponymous Robot Unicorn needed to run and jump from platform to platform. Still, be that as it may, your mission is to get from A to B as quickly as possible, collecting orbs/batteries on your way. Touch the electrified spikes and you’ll die. Your character can either jet boost through air, or underwater – evidently robot pets in the future are waterproof! I mention Jetpack Joyride and Robot Unicorn Attacks! on purpose as these are benchmarks in the endless-runner genre with satisfying responsive controls. The point of these games and why they’re so satisfying is that in general, if you die you feel like it’s your fault, leading you to furiously click replay to beat your high score. Unfortunately for Pet-Bots the opposite is true. Death comes cheaply due to poor controls and generally unimaginative level designs that are only suitable for a more accurate control scheme. To move Robo-Surfer-Cat, swipe in the direction you want to move, the faster you swipe, the faster your character goes – sounds easy right? In principle the control scheme makes sense, however Daygames North’s execution is somewhat lacking. While the Google Play store listing talks about ‘throwing’ controls, your avatar’s futuristic surfboard has jets that propel them to the destination. This gives you the feeling that you are in fact controlling the thrusters of the surfboard (and not throwing the character). The problem here is the complete ignorance of momentum – changes in direction are instant and make the controls feel cheap. The controls also lack granularity, the swipe gestures are simply not accurate enough to control the character with precision. This is not helped by the fact that your Pet-Robot’s character-model never changes – he/she/it doesn’t tilt or react to their environment which breaks the immersion of playing – somehow you don’t quite feel a connect between your actions and what the character is trying to do. 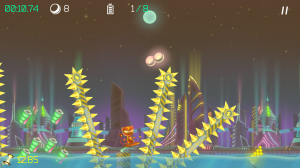 Content wise, Pet-Bots has plenty of levels and 2 modes – Level & Challenges mode. 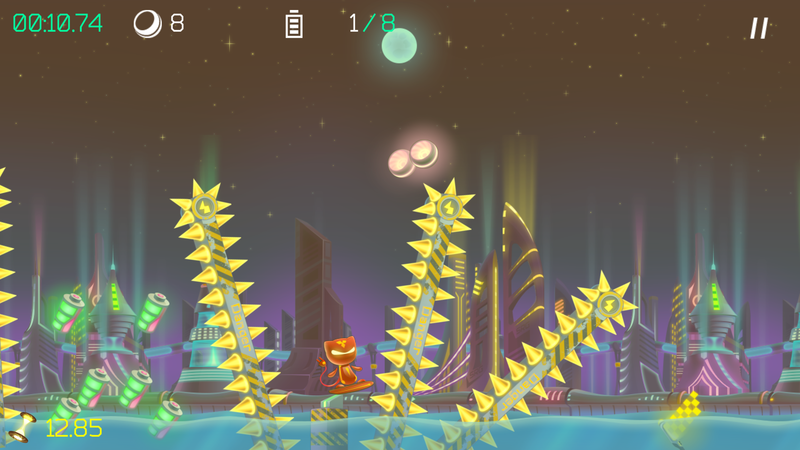 With level mode the camera is locked on to the character and you need to get from A-B, collecting batteries on the way. Challenges is a much more Jetpack Joyride style affair – avoid the obstacles to keep ahead of the scrolling background and it is here that Pet Bots feels more fun. The added sense of urgency and the challenges are much more compelling than the slow (precision?) based designs of level mode. Levels in both modes also have power-ups scattered amongst them(standard genre fare – such as magnets, time-slows etc) but ultimately don’t add too much fun to the game. 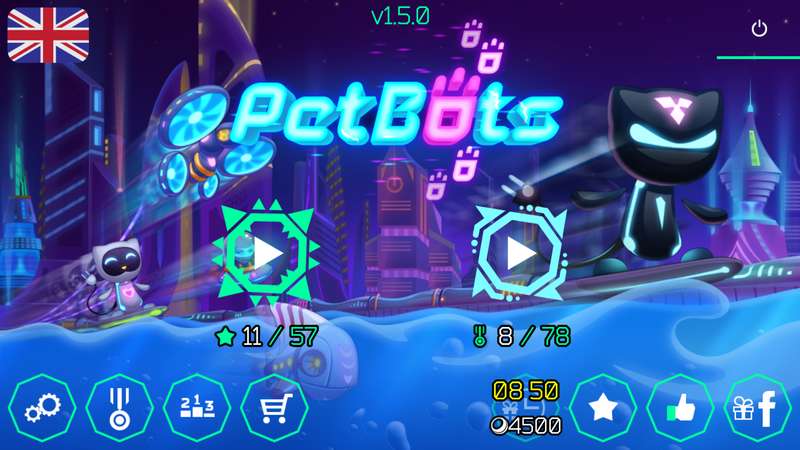 Pet Bots is however a relatively nice looking game, with a special shout-out reserved for the smoothly animated parallax background. A very nice touch (and perhaps the high point of the game) is that using the energy you collect you can ‘power up’ the city that you see scrolling in the background – tying in nicely with the ‘story’ of Pet Bots. Menus are also vibrant, sharp and responsive. The characters are not bad looking but are so static and non-reactive it feels like a flash game from the 1990′s. Using in-app purchases to change your character to other weird and wonderful robo-pets (such a robo-fish and quadro-copter wasp??) aren’t cheap (~£3.49) though we must note (and applaud!) that all in-game currency can be earned by slogging through the challenges in-game and by sharing the game on Facebook etc.